Buying any home whether it’s your first, or twenty first, is a BIG deal. For most of us, buying a new home is the biggest investment we make in our lives. That’s why It makes sense to prepare yourself. You may want to study and train a little. If you’re really serious, you may even want to become a Home Buying Jedi Master. The Home Buying Jedi Master knows how to sort through the clutter on the web and HGTV. The Home Buying Jedi Master knows what houses are selling for where she wants to live. The Home Buying Jedi Master knows how to protect herself from a bad investment. The Home Buying Jedi Master writes offers that get accepted. The Home Buying Jedi Master works with her agent before, during and after the sale. 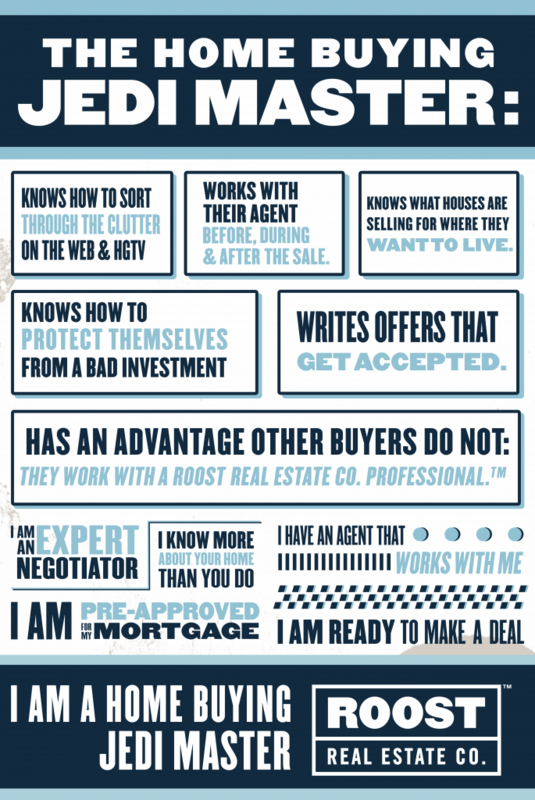 The Home Buying Jedi Master has an advantage other buyers do not – she works with a ROOST Real Estate Co. Professional. Whether you are a first-time buyer, a move up buyer, an investor, or an empty nester, we have the experience you need to navigate your local real estate market. We help people just like you become Home Buying Jedi Masters. Give us a shout and find out how we can help. * If you’re a Star Wars fan – you understand where we’re coming from. If not – we still think you’ll get the idea! For more information visit our Buying a Home page.